You can’t start analysing the Chinese digital market without discussing its size. China is a massive country with more than 1.4 billion people. With 722 million internet users, China represents the biggest population of internet users in the world, followed by 460 million users in the United States and 292 million users in India. Despite its leading position, China’s internet penetration is just over 50% (compared with 89% in the USA), a figure which reveals its huge potential to grow in this unique ecosystem. The way that Chinese consumers behave online is radically different from Western habits in many ways: from the platforms they upload content, how they navigate them, and the way content is shared. China’s social media landscape is fast-paced, complex and much more innovative than its western counterparts. For brands looking to achieve long-term growth in China, social media is a crucial turning point in their online marketing strategies, and one of the most effective ways to reach a targeted audience. Nonetheless, the complexity and unique characteristics of these platforms requires an equally unique strategy that is tailored to each platform and the ever-evolving preferences of the Chinese consumer. 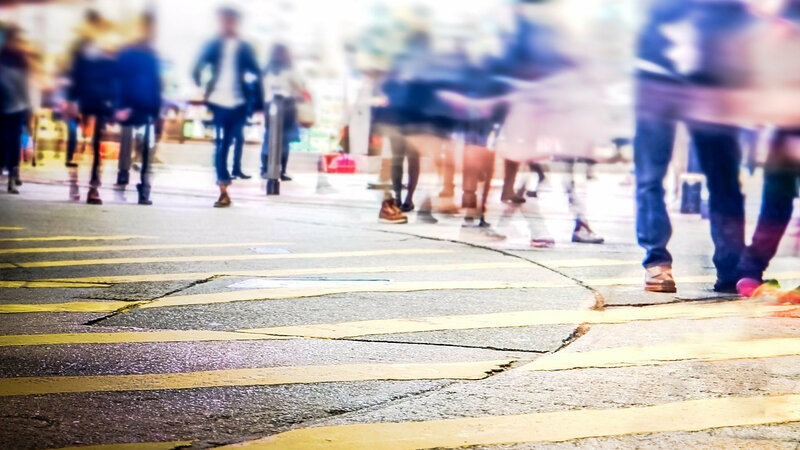 Understand mobile use in China is key to understanding how individuals use social channels. 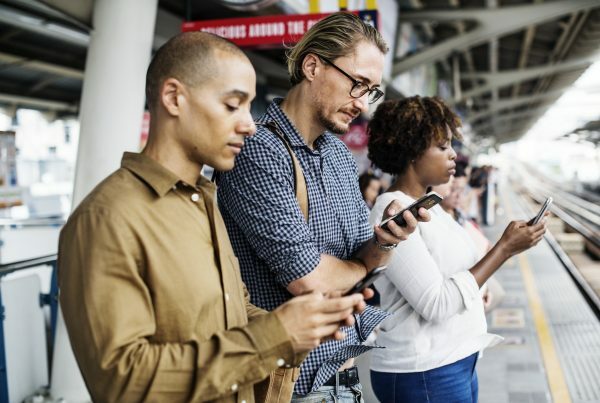 With 717 million mobile users (Three times more than in the United States) and 527 million users who pay with their mobile phones (Eleven times more than in the United States), it’s evident which device dominates usage time. This strongly impacts the ways channels are used. Social channels in China are designed to encourage you to share your daily life events (for example WeChat encourages you to share your “moments”), in the same way as Snapchat or Instagram stories have been tailored for mobile use only. Growth on these platforms has been exponential (by the number of active members as well the number of different functionalities) with a growing number of innovative features, they could be regarded as a mobile lifestyle platform rather than just a “social network”. Authentic reviews and mutual trust are essential in social platforms. Users value their friends’ recommendations above all other sources to try out new shops, restaurants, places, trips and more. This word of mouth 2.0 is especially valued in a country with a consumer landscape characterised by scandals and a general atmosphere of mistrust and scepticism amongst buyers. All of this means that marketing from traditional sources (i.e. from the brands themselves) is less trusted than, say, Wechat moments. According to a survey carried out by Hong Kong Trade Development Centre (HKTDC) in 2017 on the Chinese middle class, people are encouraged to share their moments “so that their friends can understand them better”. More than half of the respondents to the survey agreed fact that the information shared by their friends could “trigger their impulse to buy”. In short, the typical Chinese consumer relies more on recommendations from friends and family than their Western counterparts. In the past five years, Key Opinion Leaders have become extremely powerful in China due to a weakened trust in official sources. As a result, consumers turn to social media platforms to view recommendations and to seek advice from KOLs. This ecosystem has allowed KOLs to thrive. 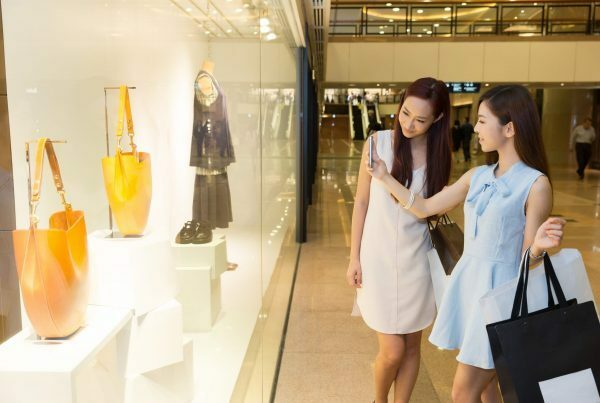 Chinese consumers, in contrast to Western consumers, accept being sold to on social media and will use it as a trusted reference before making a purchase. A study carried out by Accenture in 2017 found that 70% of the Gen Z (people born after 1995) will shop directly on social media platforms. KOLs are so important in China that a comprehensive digital marketing strategy targeted to local consumers will include managing KOLs. To illustrate this phenomenon, last year a famous Chinese KOL sold 100 limited edition Mini Coopers in 5 minutes on WeChat. Yes, we said in 5 minutes! to compare (Amazon, Google, other brands), to find inspiration (Instagram, Pinterest), to ask their friends for advice (Facebook, WhatsApp), or to communicate with the merchant for more information and, finally, to make a purchase. In contrast, e-commerce platforms in China are designed to provide a rich and unique experience. 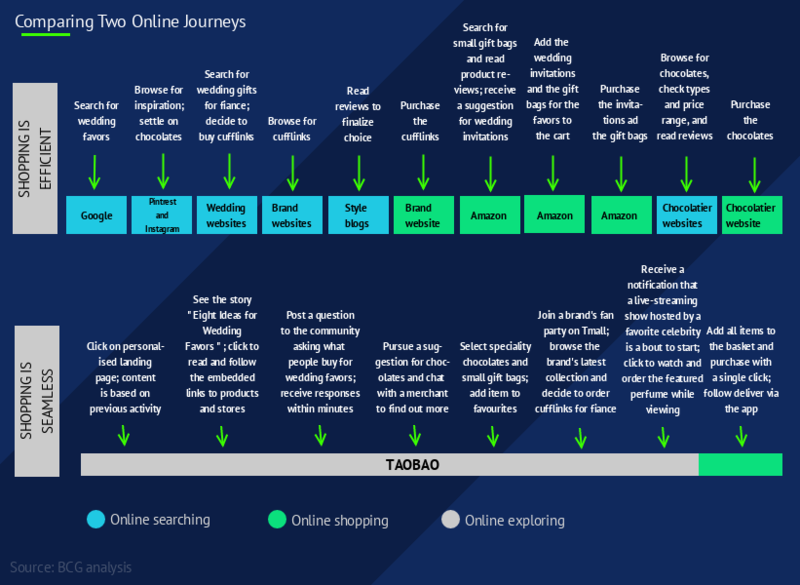 Shopping online is seen as an adventure: mixing social, entertainment, and the purchasing experience where consumers take their time and explore – just as they would if they were strolling through a mall with friends and family. Marketplaces use the huge amount of data they capture (social interactions, localisation data, shopping preferences) to provide a tailored experience, updated in real time. Personalised recommendations, whether they are for promotions, brands, or content, are generally very accurate. In China, the architecture for these platforms encourage consumers to stay on the same platform to search, find inspiration, ask friends, see what KOL’s are wearing and recommending, chat with the merchant and make a purchase. The Chinese social media industry is one of the most unique, diverse and dynamic ecosystems in the world. Two main platforms are leading the way: WeChat and Weibo. Weibo (roughly the Chinese equivalent of Twitter) would be described as a public platform while WeChat (roughly the equivalent of Facebook) is used to personally connect with a big circle of friends. These platforms have a Swiss-army knife approach. Each platform is a unique mix of everything. For example, on WeChat (boasting an impressive one billion users and counting) users can: share pictures and videos, send texts and voice messages, phone and video call, but also purchase movie tickets, order a taxi, pay bills, send money to friends, join discussion groups (personal or business), transfer money, pay in shops, read the news, follow official brands’ accounts, share a real-time location with a friend, scan QR codes, buy plane tickets, find and connect with people around them, and more. Practically anything is doable, and nothing seems to be stopping the creativity and innovation of these platforms. It is important for brands to master these functionalities to turn their actions online into opportunities to reach and connect with their desired audiences. Brands must also recognize that campaigns, trends and ideas that they have implemented with success in Europe will not necessarily work in China. Everything must be localized, from the concept, to the KOL strategy and the type of content posted. Competition for content on these channels is fierce and brands are no longer competing on products alone. Experience, and especially content, must be authentic with user-oriented videos, entertainment and excitement. For example, the French cosmetic brand “Clinique” launched a 40-episode series broadcasted daily where their line of skin care products were the focus of the plot. This advertisement was viewed more than 21 million times and Clinique’s online awareness is now 27% higher than its competitors. Successful content strategies are original, appealing, unique or funny and brands have understood the necessity to invest in dedicated marketing teams to create meaningful and exciting experiences for their attentive but fickle audience. On Taobao, Tmall or JD.com, merchants work with celebrities on live streaming events to promote their products and encourage purchases with direct links. To build and create the best online content, brands can find inspiration from offline experiences to build unique, content-based games, series, films, and fashion shows to create the ultimate social and shopping experience. To conclude, brands must adapt their approach to social media in order to remain relevant and interesting to the modern Chinese consumer. Strategies such as adapting content to the local culture to overcome international brand mistrust, or working with KOLs, will help brands increase their reach and win the hearts of consumers. Finally, brands should pay attention to emerging trends to capture niche markets and distinguish themselves from competitors, such as by testing live-streaming or diversifying their social media platforms.